The CEO has a myriad of complexities, stakeholders and business drivers to address (reduce costs, increase revenue, become more efficient, get bigger) and Architecture can simplify these inputs and provide a bridge between CEO aspirations and the business ability to deliver on these aspirations. However, there is a caveat. The strength of your Architecture capability is a critical input to successfully supporting CEO aspirations and to avoid over promising and under delivering the Architecture function. In this article, I will outline what Architecture capability needs to be established and how the use of Architecture tools and templates can be applied to business strategies such as Merger and Acquisitions and play a central role in realizing the benefits, outcomes and growth path for your company. As mentioned, being realistic about your current Architecture capability within both the business and technology domains is critical to reaching out to the CEO. If you are unable to convince your immediate Sponsors and stakeholders of the value of Architecture to the company it is unrealistic to expect the CEO to bite the cherry and directly engage the Architecture team. In order to address Executive needs it is critical you have a level of Architecture capability that can be applied to the business problems they face. 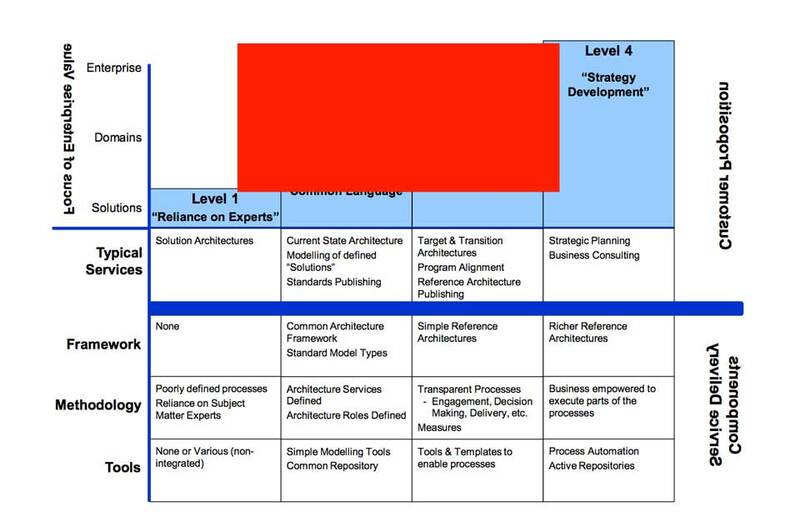 The following diagram outlines an Architecture Maturity Model and enables a plan to be established that builds a “Fit for Purpose” Architecture capability required to support the business. 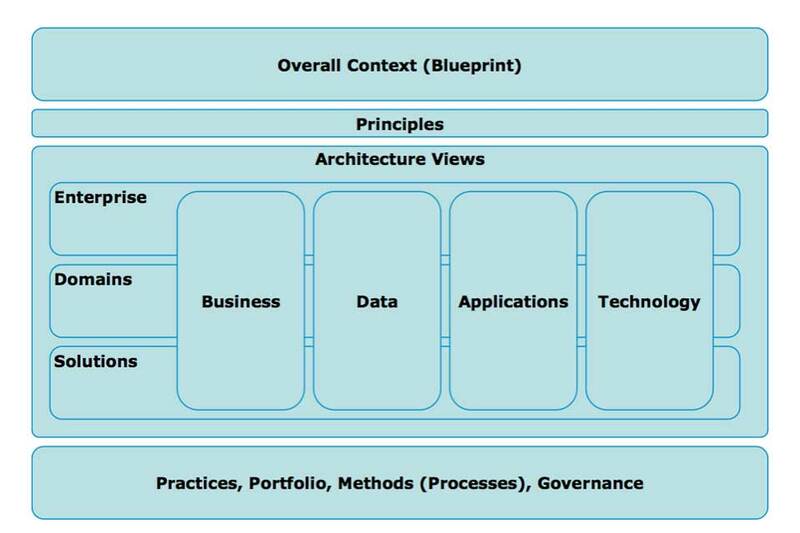 An EA Framework that outlines the library of Architecture artefacts enables a clear and consistent approach to developing and deploying your Architecture capability. Your engagement of Executive’s requires a level of respect and a consistent track record of successful Architecture initiatives and outcomes to earn the right to discuss opportunities to leverage your Architecture Framework. Business, Service or Technology Organization Model – current organizational chart or Functional Model will confirm what People assets you have and what Services you will potentially acquire. Enterprise Data Model – defined to at least level 0 / 1 to support high level analysis and integration assessments. The strength of these Architecture tools is that they allow for early diagnostics of your target company with the ability to establish the true state of skillsets, customer / product value segments, service offerings, application and infrastructure capability and integration issues and requirements that will need to be addressed. All of these inputs will provide significant insights to the bid team in order to better match the bid target price with the actual value to be obtained. If you have a mature Architecture capability, then a logical next step is to utilize the Architecture capability to create a formal review and governance environment to support M&A activity. This involves having a central Architecture owner for both the Business and Technology Domains to co-ordinate Architecture activities and inputs with the Due Diligence and Integration teams. From an M&A perspective, a key focus for the Architecture team is comparing all of the different platforms between your current and target environment and the current environment of the target entity. Addressing the Business Model, Applications, Data, Integration, Infrastructure, Technology Services, Security and Change Management inputs will enable a holistic view to be established and compared logically across all environments. Managing the data inputs to a point where they can be categorized, structured, analyzed and insights established will provide a quick overview of the target environment for the Due Diligence and Integration teams, usually within 1-2 weeks. The beauty of getting the data from all environments is that if you acquire a company with a capability that you don’t have, you can accelerate or modify your existing roadmap and cost assessments to bring that component in, at least for that business area, as a test case for rolling it out to the rest of the organization. 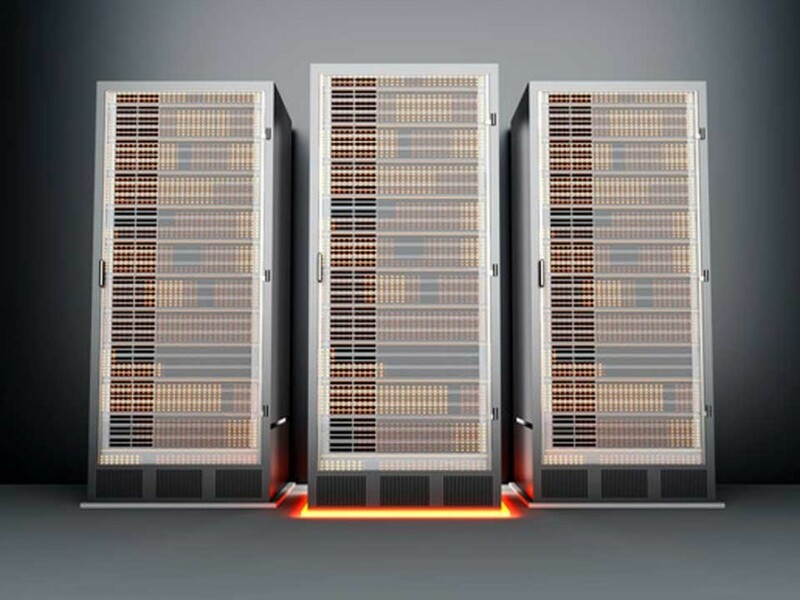 Having an agreed future-state architecture for your platforms also allows the acquiring company to be proactive in these situations and gain a greater degree of confidence in the insights being provided. Architecture Principles provide the guiding lights for how Architecture is deployed and are critical hooks for ensuring that Architects and Architecture Governance decisions are aligned. Nowhere is this more important than in guiding integration decisions and “order of magnitude” cost estimates involved in the takeover. Another point to consider is that a review of Architecture Principles at the Target Company will quickly identify any differences in culture and approach to developing and delivering systems i.e. level of customization, platform standards and therefore the level of integration risk. Business Capability Model – The Business Capability Model is one of the easier models to deploy in an M&A setting due to the ability to create subjective assessments of business capability in the Acquiring and Target Company. Infrastructure Reference Model – Armed with knowledge of your existing current and target platforms enables gaps and overlaps to be identified and assessed. Impact assessments on your Target state also provide valuable ammunition for Integration planning and Bid Price refinement. Applications Reference Model – The base Application model also provides a script for interrogating the target company environment on the state of the Applications portfolio. Reviewing Enterprise License Agreements (ELA’s) also provides insight on what contracts and integration issues need to be addressed. Business / Technology Organization Model – Whether you are reviewing the business structures or technology structures of your target company, using a Business or Technology Reference model provides a script to quickly grasp the organizational structures, number of FTE’s, Services being acquired, cost base and integration risks inherent in the target company. Enterprise Data Model – Data integration has a habit of extending project scope and costs and unless it is actively managed within an organization it is a fair bet that integration costs will be significantly more than originally estimated. Visibility of your Level 0 / 1 Subject Areas and the System of Record will support high level analysis of Data dispersion and integration needs. The Architecture templates used for M&A enable the capturing and classification of data and analysis and levelling of this data provides significant input to the 100 day Integration plan. Order of magnitude cost and risk estimates can then be applied to the key integration streams. When the Architecture function commands the attention of the CEO and Executive Team it brings to life the value that Architecture can deliver in supporting an organization’s business strategy. The simple Architecture Reference Models on a page can be tailored to specific audiences and provide a “picture” that is clearly understood and able to communicate the right messages and avoid the need for someone like the CEO needing to read through a 100 page written document to understand what is being acquired. Architecture success factors for M&A include a mature EA function / framework, clear representation of your own organizational assets and acceptance by the CEO and Integration team of the value to be achieved from the Architecture tools. It is not an unrealistic goal for the Architecture function to reach into the CEO and Executive Suite. If your Architecture teams can consolidate the Architecture views within your organization, achieve good governance outcomes and engage sponsors / stakeholders then using your Architecture capability and strength will address many of the CEO growth, M&A and integration challenges they face. Andrew Swindell is an Enterprise Architect for BHP Billiton based in Perth, Australia and is supporting a multi-year programme of work to deliver driverless trains and automation capabilities in the Pilbara. 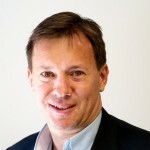 Andrew has over 20 years experience in the field of Information Technology and Architecture, published a number of white papers on Enterprise and Information Architecture topics and has successfully supported a number of country and company-wide initiatives in Australia and New Zealand.